"She liked to cook and to have the food she cooked appreciated and eaten, and whenever we saw her, she always urged us to eat. She cooked hot bread--crescents and brioches--for breakfast two or three times a week, and she would bring these into the dining room herself and say, 'Eat, eat, eat!' When the maid took the serving dishes back into the pantry, we could sometimes hear Anna, who was standing there, say, 'Good! They eat.' She fed the garbage man, the milkman, and the gardener. 'Eat!' she told them. 'Eat, eat!' On Thursday afternoons, she went to the movies with the maid, but she didn't enjoy the movies, because the actors were all so thin. She would sit in the dark theatre for an hour and a half watching the screen anxiously for the appearance of someone who had enjoyed his food." John Cheever's short stories are incredible. I am rereading them now, and they are just as good as I remembered. Even more impressive is that I enjoy them even though many of the characters aren't very likable...simply because they are so well written. This cook, Anna, seems different, though. She sounds like a winner. She kind of reminds me of my aunt, too. My aunt is always trying to feed everyone, and she always thinks everyone is too skinny. Oh, to be served hot brioche every morning! Anna sounds like a godsend (or a devil, for dieters and diabetics). 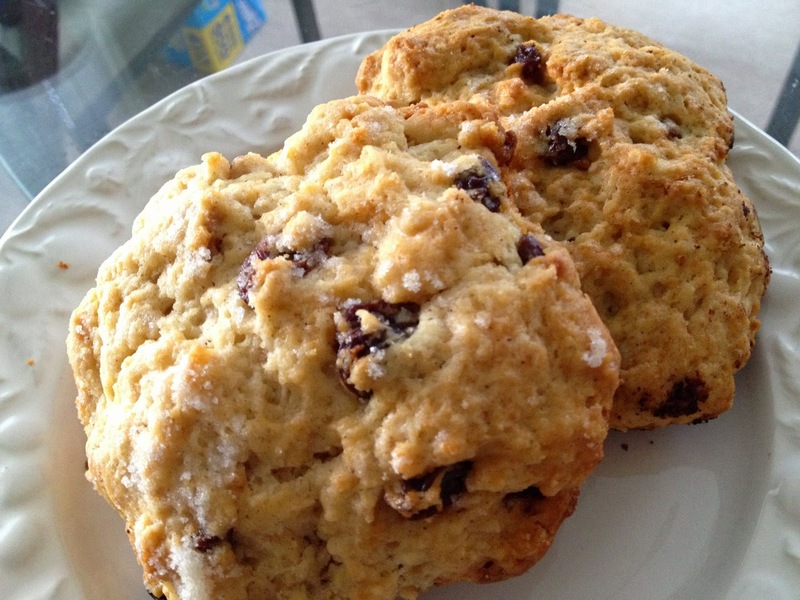 One of my mother's favorite breakfasts is raisin scones. I made a batch for her birthday this year, and I added walnuts because she's nuts about them (pun intended...haha). I don't know about you, but I like a scone with a bit of crunch on top. If you have turbinado sugar (sugar in the raw), sprinkle some on top of the scones before baking, and you'll be in for a real treat. I used regular granulated sugar and they still turned out great. Ina Garten's recipe is the best one I've seen so far. Fluffy on the inside, with good crunch on the outside, these scones are decadent but still somehow manage to be light and airy...a winning combination found only in the best pastries. And with only two tablespoons of sugar in the whole batch, they are also not too sweet. Here's the link to the recipe (also below). If you're craving carbs at their best, you won't be disappointed. Combine flour, sugar, baking powder, salt and cinnamon in a large bowl. Work the butter into the flour mixture with a pastry cutter or your fingertips until the butter is broken down into marble or pea-sized morsels. Fold in the eggs, cream, raisins and walnuts and mix until just barely combined. Sprinkle a clean countertop with flour. Pour the dough onto the flour and use a floured rolling pin to spread it to about an inch thickness. Cut the dough into triangles or form into roughly 3" diameter balls. Place the scones about an inch or two apart on greased cookie sheets. Sprinkle with sugar (turbinado sugar works very well, for added crunch). Bake for 20-25 minutes until golden brown around the edges. As Anna would say, it's time to "Eat, eat!"